Mordechai Hawke is a ruthless bounty hunter known throughout the border worlds. His ship, called "Talon", is a surplus Lelantos-class search and destroy vessel which has been upgraded with cutting edge technology. The ship's registered name is "Lex Talionis" - Latin for the Law of Revenge. This is the ancient source of the "eye for an eye" concept of justice - something Mordechai has embraced fully. The Lelantos-class was developed early in the war to fill a variety of roles. With an fair sized bay, it could easily carry a small craft, troops, and supplies. It was also well armed and armored, and was exceptionally maneuverable both in space and atmosphere. With a pair of Serena-class fighters in the bay this class of ship proved very effective at long range search-and-destroy operations. By the end of the war, this was the official military classification for the Lelantos. In the post-war era, the design has been adopted for non-military use as a general cargo transport. The unmodified bay is designed to hold and secure two standard HMT-337 cargo containers side by side. With the entire lower deck cleared out for maximum cargo space, four more can be carried. This is another mid-sized ship designed to support a group of players in a variety of campaigns and maps are provided for both the prisoner transport and cargo versions. As a sample bounty, the "Wyvern" is also included in it's own complete document. This is a Valkyrn interceptor turned into a bio-organic alien hybrid. 16 page PDF file detailing the ship, interior areas, and crew. 8 page PDF file detailing Wyvern in the same way. Full-color 22 page PDF file containing complete interior maps. Miniature-scale composite map of the ship interior. A poster-sized, 24x36 inch, 150 dpi, color JPEG image. Art directory with rendered images of Talon, Wyvern, and the 7XR ground car. 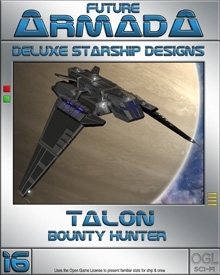 Like all of the Future Armada ships, Talon is meant to be useful to game masters and players alike. Story, stats, and maps are all easily separated. Keep what you like & change what want, it's in your hands.